I know I'm on honeymoon and I shouldn't be posting here (nobody tell my wife! haha) but I'm doing lots of story writing whilst lazing around the pool and I've got an urgent question before I can write my next stage! Anyway I know the northern army was based in Luoyang but I don't know if that means actually inside the city or in a nearby barracks or something? Do we know how they spent their time? I'm presuming in a similar fashion to those on the northern frontier? Also if anyone has any information on the size of the city (both population and square miles) in the build up to the YT rebellion I'd approach it! Or anything else to do with the layout of the city! I've found a book referenced in a Loewe book called Lo-Yang in Later Han times by Hans Bielenstein that looks like it might be pretty good! Does anyone have a copy of it or know anything about it? Edit: The above book isn't in stock on Amazon and isn't in the SOAS library so it seems unlikely I'll be able to read it. I also discovered an older Rafe book I'd not heard of called 'Fires over Luoyang' which has a section on Luoyang. It's out of my price range so it will have to be a library trip book when I get home I think! OK, one more question on the Northern Army, hoping that this one might be something that someone will know! When was the last time the Northern Army would have seen action before the YT rebellion? In 177, they attacked the Xianbei and lost badly; I do not know of any battles up north between that and the turbans, but I may have missed some. And it's true that Zhu Jun crushed Dragon Liang's rebellion in 181, but since that was far to the south in Jiaozhi, I highly doubt they used the northern army. Interesting and that was a battle fought by the Northern Army not the Frontier ones? As you say, it sounds unlikely Zhu Jun commanded the Northern Army for that battle! Sun Fin wrote: I've found a book referenced in a Loewe book called Lo-Yang in Later Han times by Hans Bielenstein that looks like it might be pretty good! Does anyone have a copy of it or know anything about it? It looks like you could read Hans' book in Sweden, if you ever find yourself in the Nordic countries. Might be a little easier before Brexit is triggered. Alternatively, you could email them request an excerpt. Not really sure how Swedish museum libraries work, however. We cannot contact Hans Bielenstein about it, because he passed a couple years ago, at age 94. Fire over Luoyang is in SOAS though. Thanks buddy, I'm planning a trip in to SOAS to browse that book among others! Just discovered this book on Google Books. It's called The Magic Square: Cities in Ancient China by Alfred Schinz. If I'm honest I'm sharing it here more so I can find it easily at a later date but from what I've read so far it seems a well sourced and well informed book. I haven't heard of the author but it's retailing at about £170 on amazon which is normally suggests that it is an academic book of good standing! EDIT: After reading the section on this book that is relevant I have had to utterly re-think my Luoyang geography. Not all this information comes from this source, I'm also using information from some of Rafe and Leowe's work! 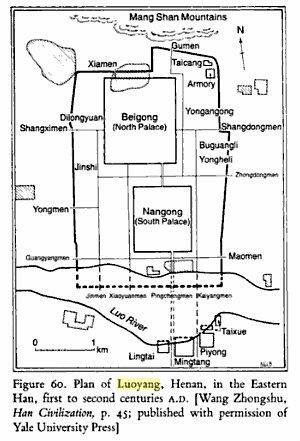 It appears that the main walled city pretty much just contained the Palaces, the court, home of some important officials and Hostel's for travelling dignities (and presumably the Capital Hostel that He Jin lead the Norther Army to during a YT scare). This area was guarded by the Emperor's own guards. Meanwhile outside the 'main city' were lots of walled districts that others lived in, some were nice villas whereas others pretty much sound like shanty towns. To the North and South of the main city were two garrisons with the Northern Army in (separated to prevent any one individual being able to concentrate too much military power in to their hands). Also in this area were the markets and shrines etc. this area was patrolled by the Red Guards. Anyone know anything/any sources that affirms or detracts from this layout? I'm wondering about emailing Rafe to ask for some clarifications as I'm not 100% sure by what I've surmised. 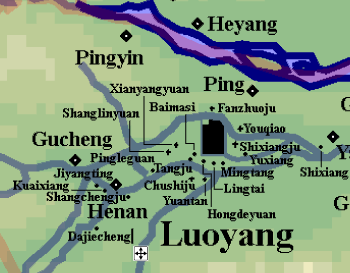 That does agree with palaces occupying a large part of the city -- and Fornadan's Luoyang area map (seen below) agrees with small cities (suburbs?) sitting around Luoyang. Thanks Dragon, yeah the word suburbs came up quite a lot to describe them so that makes lots of sense. After reading another wonderful book I picked up in a charity shop (The Pride That Was China by Michael Loewe) I am pretty certain that this is the way it worked.